Notes: Volume 15, Number 9, Issue #175. Also priced $4.00 Canada. The interview with Kevin O'Donnell mentions a book "Plains (Tor, 1995)". There is no record of this book in ISFDB. The obituary for "Franz J. Schnaubelt" refers to his legal name. On ISFDB it is listed as "Franz Joseph". The review "Laughing Screaming: Modern Hollywood Horror and Comedy" gave the title as "Laughing Screaming". The review "A Logical Magician" gave the author as "Robert E. Weinberg". The review "Necrofile - 1994" gave the title as "Necrofile 12" and did not provide editor names. The review "Lovecraft Studies - 1993" gave the title as "Lovecraft Studies #30" and did not provide editor names. The current entries in ISFDB only go to 1993 and it is not known if issue #30 is 1993 or 1994. The review "H. P. Lovecraft in the Argosy: Collected Correspondence from the Munsey Magazines" gave the title as "H. P. Lovecraft in the Argosy".The review "Jack: C. S. Lewis and His Times" gave the title as "Jack". The review "Masterpieces of Fantasy and Wonder" gave Hartwell as sole editor. The review "Future Primitive: The New Ecotopias" gave the title as "Future Primitive". The review "Weird Tales from Shakespeare" gave one author as "Katherine Kerr". The review "The Ascent of Wonder: The Evolution of Hard SF" gave the title as "The Ascent of Wonder". The review "Worlds of Women: Sapphic Science Fiction Erotica" gave the title of "Worlds of Women". The review "Technosex: Cyber Age Erotica" gave the title of "Technosex". The review "Techno Myths" gave the title "Technomyths". The review "Tomorrow Speculative Fiction - 1994" gave the title "Tomorrow #9". 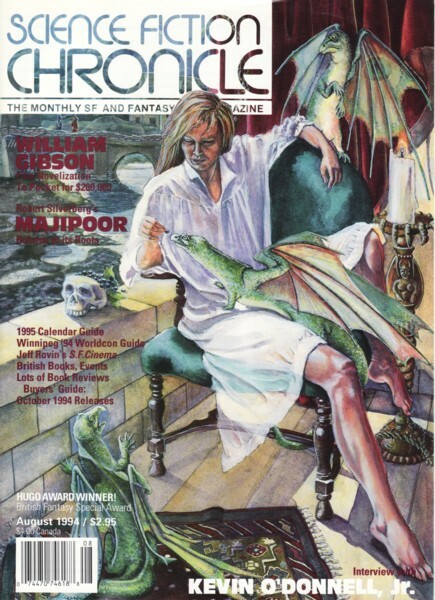 The review "Marion Zimmer Bradley's Fantasy - 1994" gave the title "Marion Zimmer Bradley's Fantasy Magazine #23". The review "Crypt of Cthulhu - 1994" gave the title as "Crypt of Cthulhu 86". The review "On Spec - 1994" gave the title "On Spec, Summer, 1994" and no editor. The review "The Third Alternative - 1994" gave the title of "The Third Alternative, Spring 1994" and no editor. The review "Next Phase - 1994" gave the title of "Next Phase, Spring 1994" and no editor.